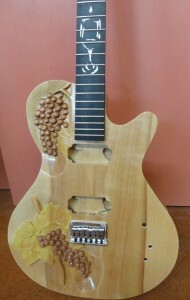 Blog | www.dastringedinstruments.com | DA Stringed Instruments, LLC. 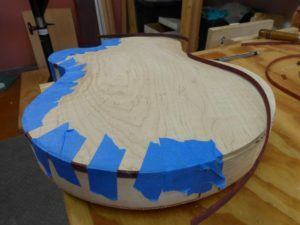 I have recently been working on an archtop mandolin, and wanted to post some progress photos. 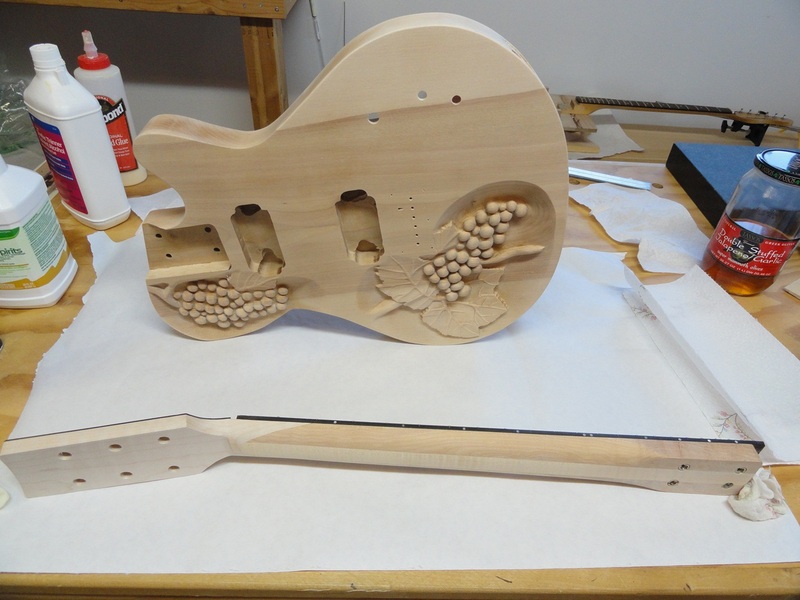 It will have a spruce top with maple neck, sides, and back. The body will be hollow, but reinforced with braces to accommodate passive magnetic pickups. 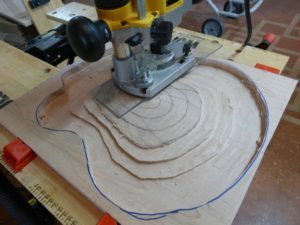 To start, I made templates of the top and back for use in a duplicating router that I had built. 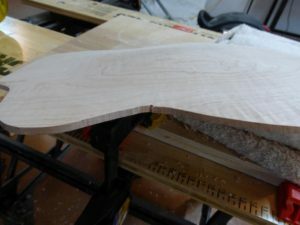 This is a picture of the rough routing of the maple back. 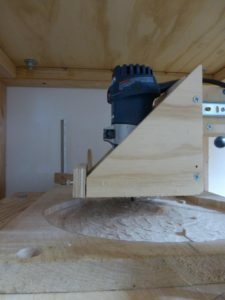 The back is then routed to conform to the template I had previously carved that is placed on the upper shelf. After finish carving by hand and final sanding, this is the back. 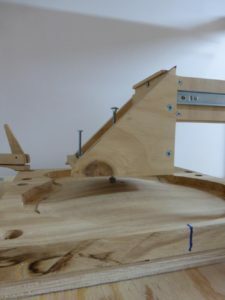 The sides were bent on a side-bender using a silicon heat blanket, and neck block, tail block, and linings added. Notice the oversized head block to accommodate the later attachment of a strap button on the side of the neck. 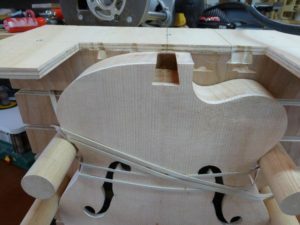 Fairly heavy braces were added to the carved top (using a template similar to the carved back above) since this will be primarily and electric instrument. Dovetail fittings are routed into the body and the neck. 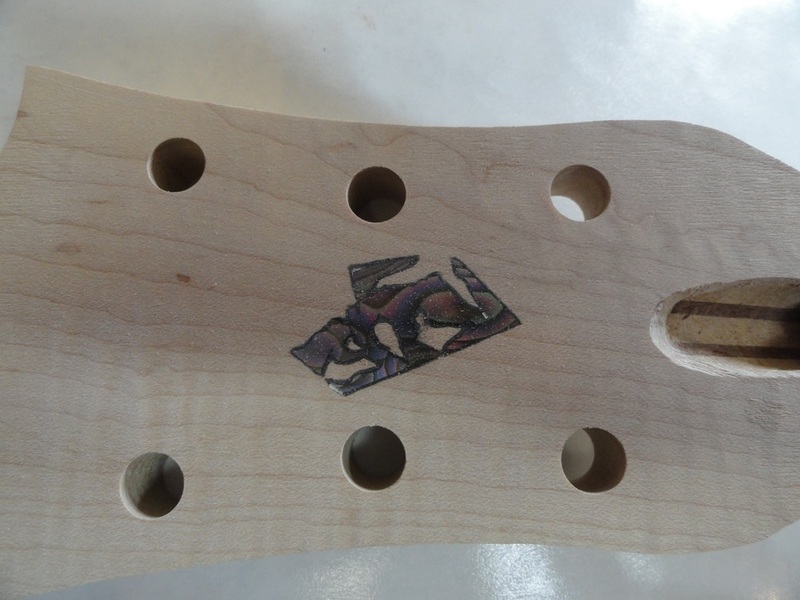 Headstock inlay on neck before final shaping. 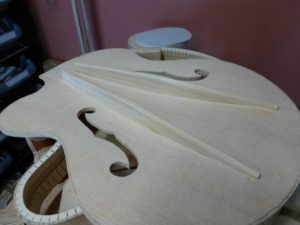 Initial fitting of the neck to the body. Back attached, and gluing binding to the body. 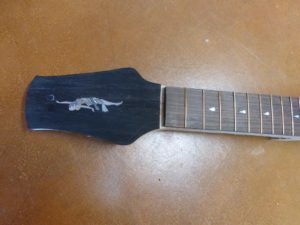 Brian, a local guitar player and instructor, had a guitar that he loved, but he was unhappy with the feel and intonation of the neck. After some adjustments, he said that it still did not play well and that he really wanted a replacement made. 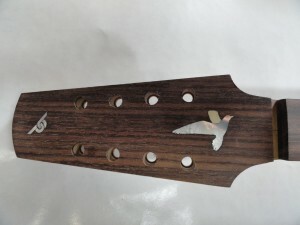 The existing neck and headstock also did not fit the overall look of the guitar. 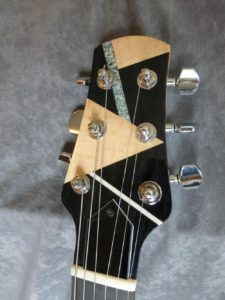 Brian wanted position markers on the side that could be seen from the top and the side, an ebony finger board, and a headstock more fitting for the guitar. The inlays are maple and white and blue corian. I had a period of inactivity in instrument building at the end of 2013 and all of 2014. 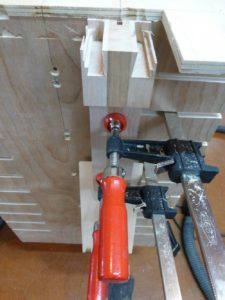 The hard use on my thumbs over my life resulted in basal joint arthritis, to the point where I could barely hold a chisel or open a door on bad days. I decided for reconstructive surgeries on both thumbs (which were great successes), but that meant that first one hand and then the other was out of commission for months at a time. 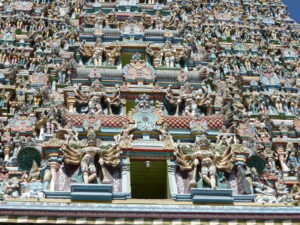 Just as healing was complete, my wife and I went to India for five months for her to continue her research into Tamil poetry. Thus the big gap in building! 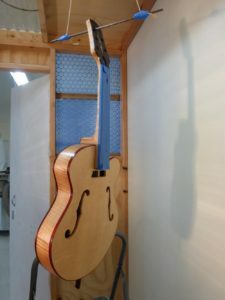 More than 10 years ago, I bought a Hofner archtop body that had apparently been sitting in an attic of the old factory. Stuffed inside was a newspaper in German from 1964. I have worked out that this was probably a Hofner model 4560. I also purchased a neck with fretboard that may or may not have actually been paired with the guitar. 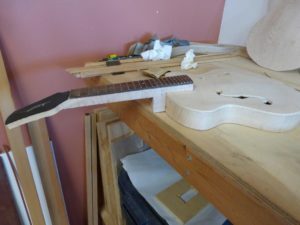 I’ve finished most of the project (binding, cutting neck pocket, adding headstock verneer, etc.) and should be able to finish up once the humbucking pickup mounting holes have been routed. 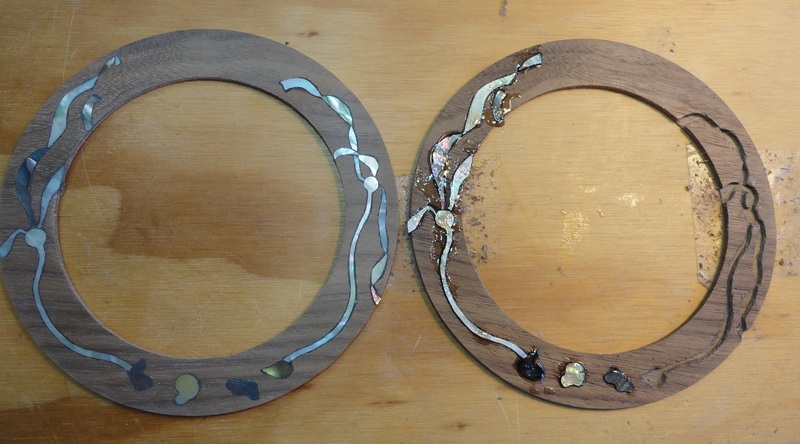 As a big departure from the original, I used pieces of mother-of-pearl and abalone that were left over after the shapes from other projects were cut out. 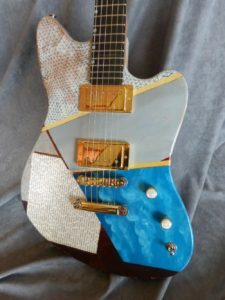 It seems to fit a sort of art deco look to the guitar. I’m working on a bouzouki for a local musician who wanted the theme to be based around a harbor seal and the marine environment. We came up with a concept, and the focal point will be the seal drawing that he had created. I’ve added stylized waves, a paddle and sea kelp. 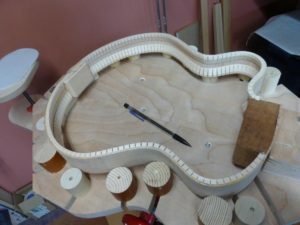 I am going to make two bodies for the bouzouki, so that he can choose whether he prefers a Western red cedar, or Sitka spruce top. The following are posts of various stages of inlay of the neck and the rosette. 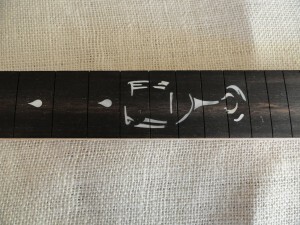 A stylized wave with pieces ready to be inlaid into the fretboard. Two rosettes in varying degrees of completion. 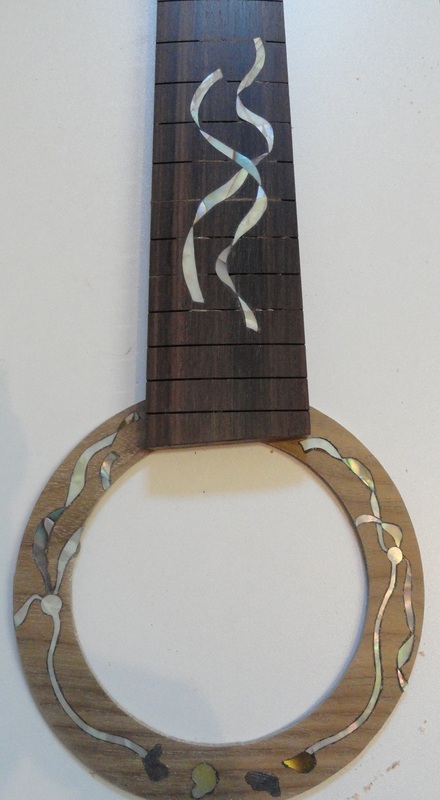 Completed inlay of kelp ribbons on the fretboard, and the finished rosette – note that the walnut for the rosette will darken significantly when finish is applied. 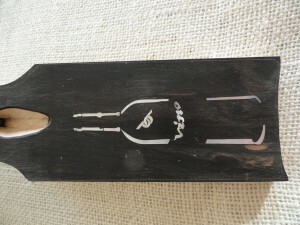 This is the finished fingerboard. 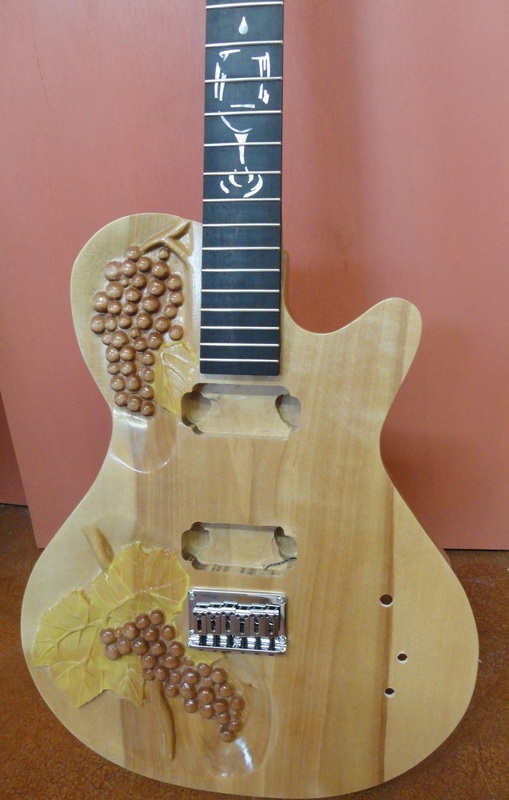 Late last year I began working on this guitar, and am getting back to it now. 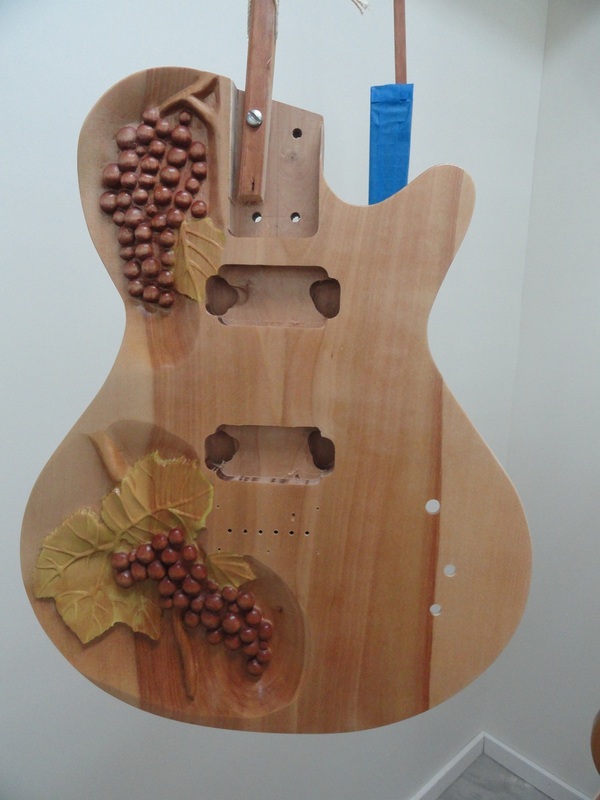 It has a theme based around wine and has a wine glass on the fingerboard, and the body will have grapes and grape leaves. 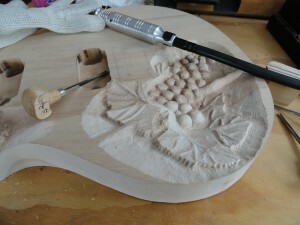 Here is a picture of the carving in progress. The headstock is still in progress, but has a wine bottle with my logo inlaid into it. 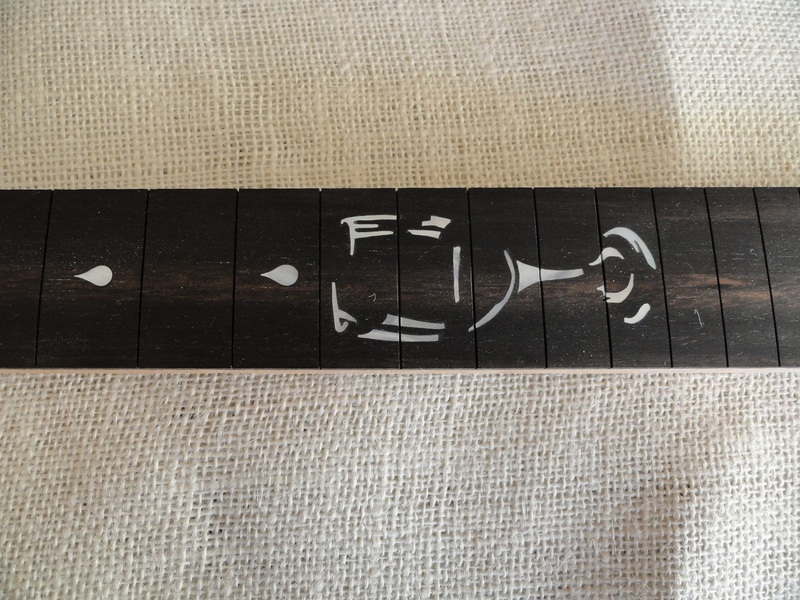 And the fingerboard has a glass of wine as an inlay. I still need to shape the back of the neck and fret the fingerboard. 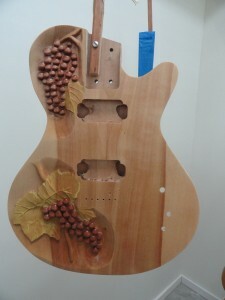 It took longer than I expected to complete the shaping and final sanding of the grapes and grape leaves. 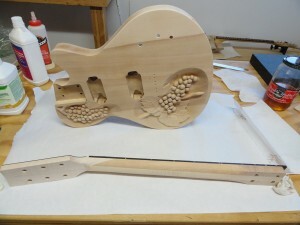 The neck is now completed and ready for finish. I used a concoction of boiled rushes to dye the grape leaves green, and it ended up being a very subtle color tending to the more yellow side of green. For the stems I used tea which also ended up being very light, and for the grapes I boiled down some Chianti wine which did a very good job of staining the birch. 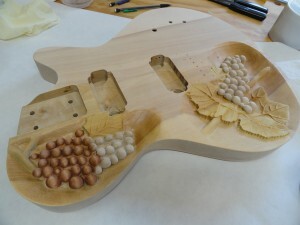 The guitar is complete and waiting for me to wind the pickups and install them. 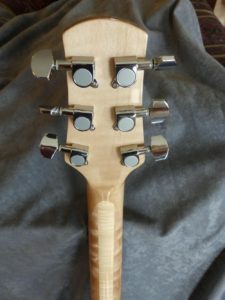 This is my first attempt at a web page for my small business of hand-crafted musical instruments. 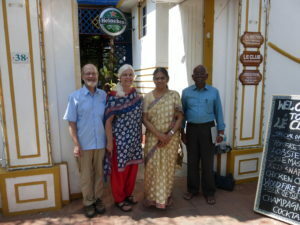 I am using WordPress and the Weaver II theme as a starting point. 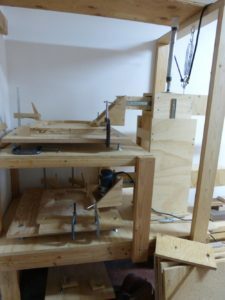 For now I will try and update webpage progress, but will soon add posts of instrument builds. Thanks for looking.